If you locked in your interest rate on a home this past week, congratulations! The Indianapolis real estate market may not find better interest rates than we have right now. The current mortgage rates make buying a home in Indianpolis a better financial option than leasing. A recent call from someone asking about a lease had me thinking about what the monthly cost of leasing vs. buying would be for the same home, if this person actually bought the home.I ran the numbers based on today's interest rates, as shown in the graph. In this particular case, they were looking at homes in Carmel which would sell for about $180,000. If they bought this home with an FHA loan, the monthly payment would be about $1249.00, including taxes and insurance. This amount includes the cost of mortgage insurance and would require about $6300.00 down payment plus closing costs. The home leased for $1600.00, so buying the home would save them about $350.00 a month. If they bought the home using a conventional loan with 20% down, the payments would be approximately $980.00. A monthly savings of $620.00 vs. leasing. For those who don't have the down payment, Indiana Housing has a great down payment assistance program for home buyers in Indianapolis, called the Next Home program. Today's interest rates make it more affordable than ever to buy a home. As interest rates rise, so does the monthly payment for your home. Here's a look at how the principal and interest of your loan will change as rates rise. 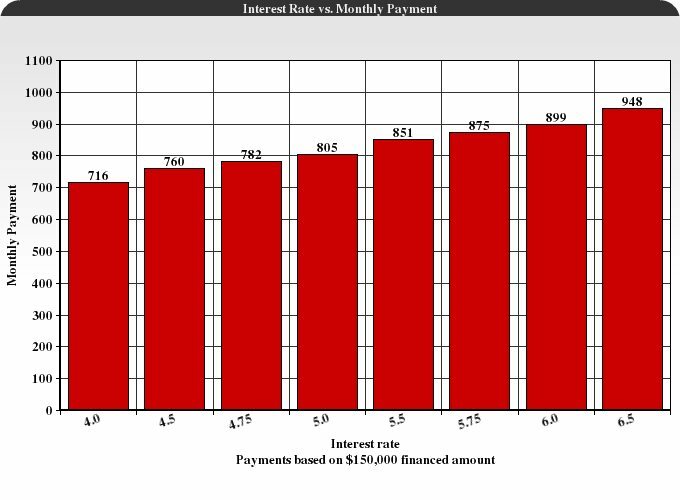 The following graph is principal and interest only on a loan amount of $150,000.00. Besides the principal and interest on your loan, you will need to add taxes and insurance. Additionally, if you put down less than 20%, you will have property mortgage insurance (PMI or MIP). In the above scenario, assuming you are financing $150,000 on a purchase amount of $155,440. with an FHA loan at 4.5%, your payment would include the following amounts added to the principal and interest of $760.00. MIP - approximately $144.00 a month. This would make your monthly payment about $1133.00; saving about $460.00 a month compared to leasing. Lenders will also figure in the cost of HOA fees when qualifying you for a loan payment. This is excellent insight for not only customers of Indianapolis but all over the country. Buyers, renters and sellers should all pay close attention to your data as it affects them all closely in these tough economic times. There hasn't been a real estate market where new buyers have had as much to gain as the current real estate market is offering. I wish I could reach more people. Not only is it a great time to buy, Indianapolis has some awesome down payment assistance programs. If people who can, don't buy now, they will be renting from those who do buy now. More importantly, they'll be paying more for a home in five years. There are a lot of things that people do consider before buying a house. And I think interest rate has a big impact when purchasing. Real estate markets are giving a lot of offers which I think buyers just have to further check..
First off, what an awesome blog! From an SEO standpoint, you did an excellent job of the site's construction and optimization. Keep it up, this is the type of site that will continue to grow in value! Nice work! Alex - Thanks! I appreciate that, especially from someone in the business of website design and SEO! This is certainly a buyer's market right now. And with interest rates being kept artificially low they won't stay this way forever. My retired father recently sold his home needlessly (at the bottom of the market now) despite being urged to rent it out as an income property. His buyer got a great deal. Minerva - These programs are great. There are a couple of programs now for both first time buyers and move up buyers who may not have equity from the home they sold. Mitch - It seems we have been saying forever that interest rates can't stay this low, yet they persist below 6% and now below 5%. The game of artificially suppressed rates can not last. I've recommended to clients it would be in their best interest to rent, but most do not want to be a landlord. The general population does not like risk. ...Just when you thought that interest rates would stay low forever... It's interesting how we in our Orange County bubble are content to complain about 6% when the reality is there's nowhere to go but up! Hold on tight, these next 2 years will be an interesting ride! Wouldn't it be nice if the government would just use all that stimulus money to give $50000 to people who wanted to invest in home buying. That would start the market up again. Great information and well presented! Paula, Great info! I agree with Jennifer as the post is quite helpful to anyone dealing with a mortgage. Such important information! Thanks for sharing it! Great post, thank you! I've been looking into buying lately and all this interest rate stuff is definitely applicable. The whole process is somewhat confusing and this post definitely conveys a lot of the details in a straightforward manner. The figures and the government schemes are of course completely different in the UK, but the principle remains the same. Comparable payments over a comparable period with either bricks and mortar or nothing at the end.......but I realise that that is an oversimplified summary!